Goodness of amaranth, jowar, bajra; Protein and fibre rich mixture. 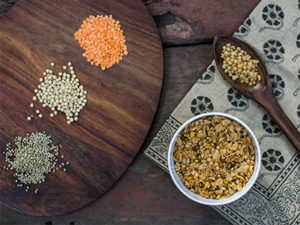 Goodness of amaranth, jowar, bajra and lentils: Making it rich in protein, dietary fibre and good fat. Amaranth Mix snack is packed with the goodness of amaranth, jowar, bajra, lentils & green gram with mouth-watering olive n herb seasoning, making it a source of protein, dietary fibre, MUFA and PUFA. 1. Amaranth is one of the most protein-rich of any plant-based food, rivaling that of animal-based foods like cheese, in addition to being rich in calcium and micronutrients such as magnesium. 2. Jowar and bajra are millets rich in iron, protein and resistant starch. Rich in antioxidants, which are believed to help lower the risk of cancer, diabetes, heart disease and some neurological diseases, they also have low GI (<55), giving the snack good satiety value.